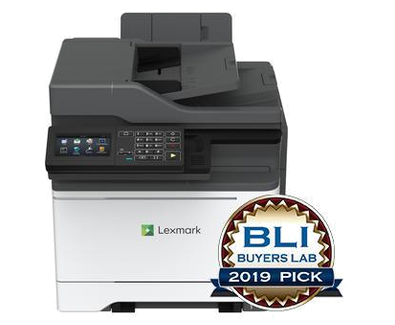 The multifunction Lexmark MC2535adwe builds on color output of up to 35  pages per minute* with a 4.3-inch [10.9-cm] color touch screen. Driven by a 1.2GHz quad-core processor and up to 6 GB of memory, the MC2535adwe prints up to 35  pages per minute* and can scan up to 50  images per minute. With its steel frame, long-life imaging system, ease of upgrades and robust paper feeding system, it’s ready for lasting performance in any environment. Beyond included USB and gigabit ethernet, this device lets you connect wirelessly via built-in Wi-Fi, as well as AirPrint, Google Cloud Print, and Mopria on any network with existing Wi-Fi access. And with Lexmark Mobile Print, printing’s as easy as hitting print, choosing your printer and picking up your job.